Joseph Medicine Crow, Historian And Last Crow Tribe War Chief, Dies At 102 : The Two-Way Medicine Crow, who was awarded the Presidential Medal of Freedom in 2009, was also the last person alive to have heard direct testimony from someone who took part in the Battle of Little Bighorn. 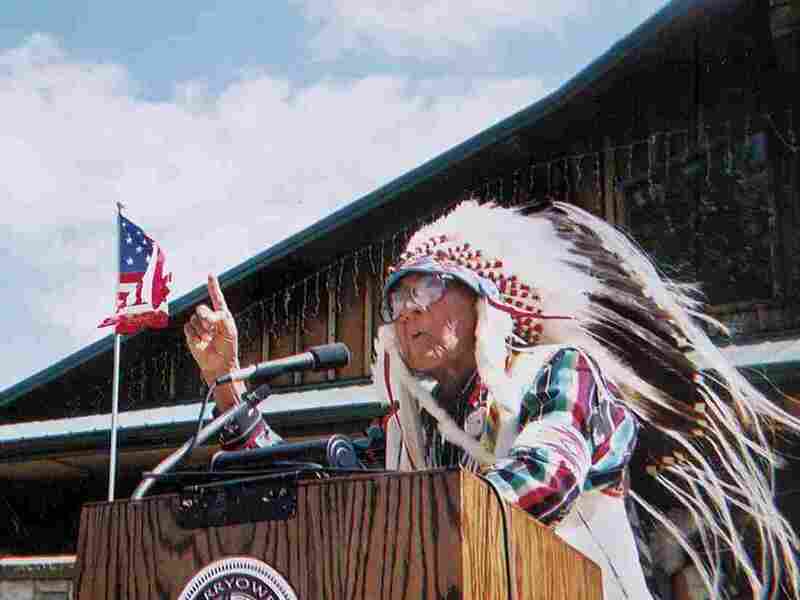 Crow tribal historian Joe Medicine Crow speaks of unity in 2001 at a dedication of a "Peace Memorial," near the site of the Battle of Little Bighorn. "He is the last person alive to receive direct oral testimony from a participant in the Battle of the Little Bighorn: his grandfather was a scout for General George Armstrong Custer," the White House said in a statement when it honored Medicine Crow with the Presidential Medal of Freedom, the nation's highest civilian honor, in 2009. "Wearing war paint beneath his uniform and a sacred feather beneath his helmet, Joseph Medicine Crow completed the four battlefield deeds that made him the last Crow war chief," President Obama said during the ceremony. "Dr. Medicine Crow's life reflects not only the warrior spirit of the Crow people, but America's highest ideals." Medicine Crow, whose Crow Tribe name was "High Bird," was also the first member of his tribe to earn a master's degree, Eric says. He went on to receive several honorary doctorates. "Joe was a true American hero," Darren Old Coyote, chairman of the Crow Tribe, told the Billings Gazette. "He was a great man in two worlds." "With his prodigious memory, Medicine Crow could accurately recall decades later the names, dates and exploits from the oral history he was exposed to as a child, [curator emeritus at the Smithsonian Institution's National Museum of American Indians Herman] Viola said. Those included tales told by four of the six Crow scouts who were at Custer's side at Little Bighorn and who Medicine Crow knew personally. "Yet Medicine Crow also embraced the changes that came with the settling of the West, and he worked to bridge his people's cultural traditions with the opportunities of modern society."